The First Fridays Art Walk for February runs from 6-8 p.m. tonight at locations around Winslow. The Bainbridge Performing Arts gallery features the warmhearted work of Stewart Daniels through February. Bainbridge Island School District will host an open house for the rebuilt Wilkes Elementary School from 1-3:30 p.m. Saturday. The public is invited to wander the halls and learn more about the district’s newest facility. The school is located at the corner of Day Road and North Madison Avenue. The energetic Sing Out! workshop and concert returns to Bainbridge on Saturday. The workshop, led by Pastor Patrinell Wright, begins at 1 p.m. at the Filipino American Hall, 7566 High School Road. The concert begins at 7 p.m. at the Bainbridge High School commons. Inside the Islander: Photos from the Martin Luther King Jr. Lane dedication. A campus street at Bainbridge High School was named in honor of Martin Luther King, Jr.
Fire damaged an island garage early Monday morning. A new memoir chronicles the sea voyages of Bainbridge’s Holger Christensen. Federal regulators sued former executives of failed American Marine Bank. 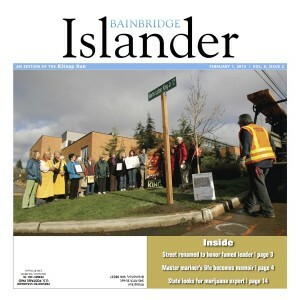 Two studies will probe Bainbridge Police Department this winter. Construction is wrapping up at the new Wilkes Elementary School. Coming Up: A group of island craftspeople may have finally found a permanent home.